I think it's because I re-organized my nail polish that I totally got into purchasing some more, which you can read about here. Or it could just be that I can't pass it up, so I had to get them. Either way, I bought some new polishes within the last two weeks and wanted to share with you what I got. Not bad for approximately $40.00 which includes 20 bottles of nail polish, glitter remover and a big bottle of Out The Door Top Coat. Here are two different ways to take your glitter nail polish off. but HATE to take it off, so I don't wear it that often. I plan on doing a review for you on these, so wish me luck! I got the KleanColor Holo polish collection off of Amazon. hoping they are as pretty on as in the bottles. 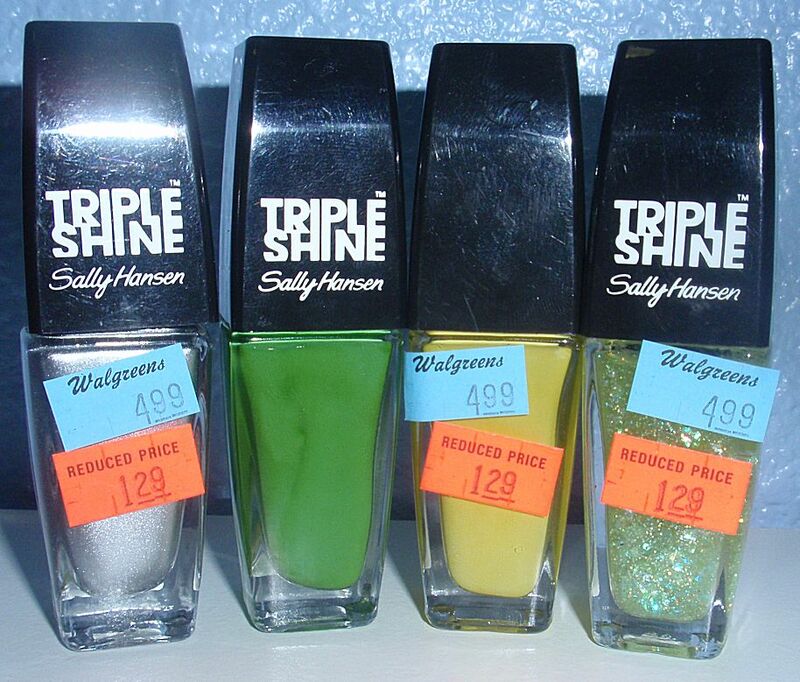 L-R: Holo Chrome, Holo Blue, Holo Green, Holo Pink, Holo Orange and you guessed it...Holo Yellow. 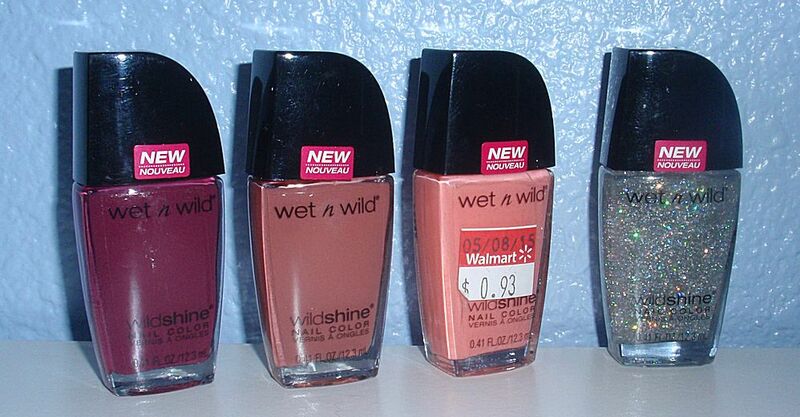 I found these new Wet N' Wild polishes at Walmart for .93 cents each. I have not tried the new ones, and at that price...why not? L-R: Grape Minds Think Alike, Casting Call, She Sells, Kaleidoscope, which I have in the old formula and love using as a topper, so I want to see if the formula stayed the same or not. Another find at Walmart...I love Sinful Colors. this one is called No Text Red. 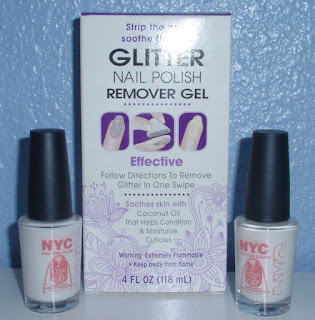 Another line of nail polish that I do not have any of. the display is so messed up that I don't even want to take the time to look. But this one caught my eye...how could it not? 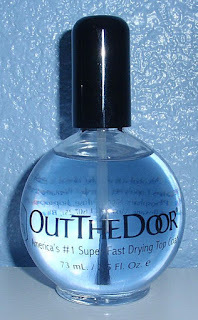 It's called Over You and it is a clear base with micro purple, bar purple and large blue and large blue glitters. See Spot Run is the name of this one by Fing'rs. It says it is a spotted Top Coat...we shall see how it works out. These were at my Walgreen's on clearance, so how could I pass them up? 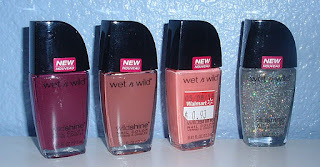 I actually got a couple of other colors a couple of weeks ago when they first went on clearance and like the formula, so I wanted to get some more before they were all gone. L-R: Oyster Bar, Kelp Out, Statemint and Scale Up which looks like an awesome top coat of Holo and Greenish flakies. I also stocked up on my favorite Quick Dry Top Coat Out The Door. I found a great deal on Amazon, which was way cheaper than at Sally Beauty so I had to do it...especially when I was almost out. I hope you don't mind me sharing some of the finds I bought. I will be back with some reviews of what I got. If there is something in particular that you would like me to either swatch, review, comment on or help out with, please let me know. I would love to know what you would like to see.